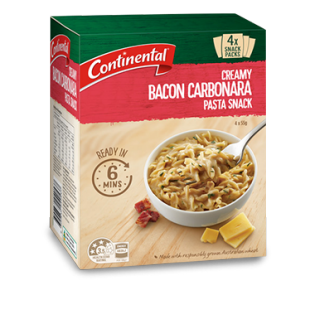 Everything you love about Creamy Bacon Carbonara Pasta & Sauce, now in a convenient snack size! With 4 serves per pack, it is completely microwaveable and ready in a matter of minutes. Now you can enjoy your favourite Pasta & Sauce any time of the day. Pasta (81%) [wheat^ flour, natural colour (carotene)], cheese powder (3.5%), natural flavour (contains milk), maltodextrin, yeast extract, corn starch, salt, mineral salts (508, 451, 452), bacon powder (0.3%), chives, onion powder, sunflower oil, wheat starch, burnt sugar, pepper extract, natural colour (carmine) ^ From responsibly grown Australian wheat. Contains naturally occuring glutamates. I Use your CREAMY BACON CARBONARA REGULARLY, I INCLUDE SOUR CREAM SHALLO TS BACON PIECES. MY FAMILY AND FRIENDS LOVE IT.